Some people are just naturally better at giving people space and don’t like invading their personal bubble. Some of us really need physical space and don’t like when someone invades our bubbles without asking or without a valid reason to do this. 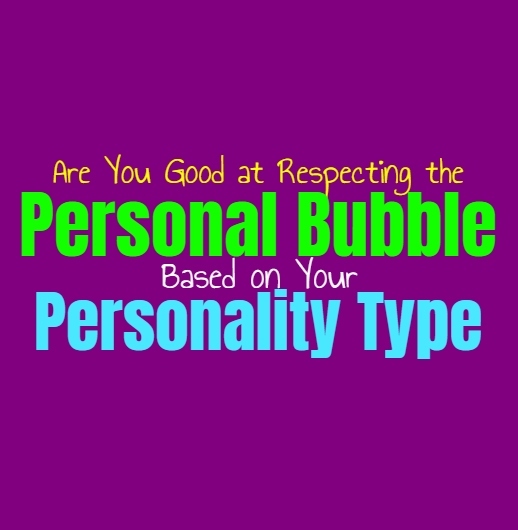 Here is how good you are at respecting the personal bubble, based on your personality type. INFJs are often great at respecting personal bubbles and can easily tell when someone just needs space. They don’t appreciate when people invade their personal space, especially someone who they are not close to. When the INFJ trusts someone they feel more comfortable with them coming into this bubble of theirs, but this isn’t a constant thing. There are times when the INFJ just needs this physical space and doesn’t want someone coming near them or touching them without being asked first. ENFJs do understand the need for a personal bubble, since there are times when they need this themselves. They can sometimes have trouble respecting it when they feel that a person needs their help though, and they might push some of these boundaries. Most of the time ENFJs are good at recognizing what others need and can sense when they just want their personal bubble to remain in tact, and they don’t feel comfortable allowing others into this space. INFPs definitely understand the need for a personal bubbles and don’t enjoy when people cannot respect this. When someone has it made it clear that they need physical space and don’t want someone coming close to them, the INFP understands and appreciates this. They become frustrated themselves when people don’t respect their personal bubbles and their need to keep this in tact. For the INFP having this type of bubble is important, and so they care about being respectful of it. ENFPs might not be great at respecting the personal bubble of certain people, especially those they are close to. When they care about someone they don’t really see a bubble around them, instead they feel like they are allowed to invade this space without warning. They do have their own need for space sometimes and can become annoyed when the wrong people invade this bubble. For the ENFP when they have someone they care about deeply they have a hard time really respecting this bubble. INTJs definitely know how to respect the personal bubble, and don’t like when people invade their own. They believe in giving people this physical space and not getting close unless it makes sense to do so. For the INTJ someone’s personal bubble is important and invading this certainly shows a sign of disrespect towards that person. When they are close to someone they become more comfortable with having their bubble invaded, but there are still times when they need to be by themselves and don’t want to have their space messed with. ENTJs can sometimes struggle to really comprehend someone’s personal space when it is a person they are close to. They enjoy feeling connected to their loved ones and don’t really believe that the bubble exists when they are deeply close to a person. When it comes to strangers then the ENTJ definitely is capable of respecting personal space, especially with those they don’t particularly understand or like. When it comes to people they love though, the ENTJ might struggle with this personal bubble. When it comes to strangers the INTP definitely knows how to respect the personal bubble, and even when someone they love requests space. For the most part though INTPs do enjoy feeling physically close to their loved ones and for them the personal bubble becomes less important when they really care about someone or feel deeply connected to them. They might feel like they can connect better with someone through touch, since they aren’t naturals are communicating verbally. ENTPs do their best to respect the personal space that others require, but sometimes the physical bubble can be something they struggle to pay attention to. When the ENTP is close to someone or really cares about a person this personal bubble becomes much less obvious to them. They enjoy communicating with these people and sometimes getting physically near to them is comforting for the ENTP. When it comes to making friends they sometimes are more physically expressive people and so the personal bubble becomes less obvious. ISTJs are often great at respecting and understand the personal bubble, since they need this space themselves. They realize that people need their own space and don’t like others invading this. They especially understand this when it comes to people they aren’t particularly close to, and so they don’t think it is right to just invade this bubble without some sort of good reasoning behind it. When it comes to their loved ones they often see this bubble a bit less, but at the same time they don’t invade it rudely or without thought. ESTJs might not be great at recognizing the need for a personal bubble, especially with the people they are close to. When the ESTJ is connected to someone and feels close to them they no longer see the need for some sort of bubble or personal space. They often want to feel close to them and don’t like feeling as if they have to remain distant from this individual. If the ESTJ invades someone’s personal bubble it is simply because they care about them and feel close to this person. ISFJs are often polite and respectful people who can recognize when a person needs space. They are good at reading people and can see when someone doesn’t want to be touched or have someone near them. ISFJs do their best to recognize and respect these boundaries, especially when it comes to people they aren’t particularly close to. When it comes to their family and loved ones the ISFJ does want to feel close to them and so sometimes they might feel the need to break past these barriers in hopes of feeling closer. ESFJs understand when someone needs space most of the time, since they are good at reading the needs of others. In most cases they have their own personal bubble as well and don’t appreciate when people ignore this. While ESFJs care about making others happy, they also want to feel close to their loved ones. When it comes to their romantic relationships the ESFJ might struggle to respect this personal bubble, since they don’t really think it should be a constant thing. ISTPs definitely care about maintaining their personal bubble, especially with people they don’t really know. ISTPs try not to feel too uptight or held back though, so they often try to let things slide if someone does invade this bubble. ISTPs are very conscious of the physical world around them and so they realize the intentions of someone who is invading their bubble. For them it often depends on if someone is trying to be intimidating or if they simple want to be close to the ISTP. ESTPs aren’t really great at handling the personal bubble of others, especially the people they care about. When the ESTP cares for someone they no longer see this bubble and often feel free to be close to them physically. They can be somewhat physical people and enjoy feeling this type of closeness with someone they love and care for. ISFPs are often very physical people and so for them the personal bubble is important. They are sensitive to the touch of others and don’t want someone close to them who they don’t trust. When the ISFP does feel close to someone they no longer have the same feelings towards a personal bubble. At this point the ISFP likely ignored the existence of a bubble and feels free to physically connect with someone. ESFPs don’t usually have much awareness of a personal bubble, and rarely do they need this respected themselves. When they like people they want to feel close to them and for the ESFP touching is a sign of consideration and affection. They might not realize when someone needs space and instead they don’t really recognize their personal bubble very well.